I always appreciate a garage to studio conversion because they’re usually small and make great use of space. 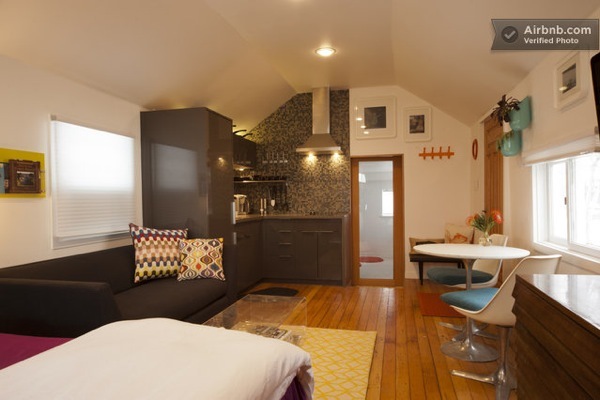 This is just that… A studio that used to be a garage which was renovated into a tiny guest house. It has floor heating, cathedral ceilings, a beautiful bathroom and a full sized kitchen ready for you to cook in. And it’s in Boulder, Colorado! Another reason I really like garage conversions is because they make better use out of a structure that already existed. And this one- as you’ll see below- has been very nicely converted into a studio that I’d enjoy living in. The kitchen isn’t huge but it does have everything you need to cook if you wanted to. Two burner stove top with hood, microwave, and refrigerator. And it’s all modern/sleek. I like it a lot, how about you? I like the clear coffee table in the living area because it adds functionality to the home while keeping it looking and feeling spacious. But other than the relatively short clearance I think they did a nice job with this bathroom. This garage to studio conversion is available as a vacation rental. Click here for pricing and availability. If you liked this you’ll love our free daily tiny house newsletter! The kitchen really stands out among most of the small homes I’ve seen. I’ve wondered how the chefs among us THers could manage in most tiny house, but this is inspirational. With a rolling island, this would be extremely workable and functional, instead of the camper-style kitchenettes we see too often. The bathroom is also outstanding, since that’s another point of contention. Granted, everyone in my family is tall, but at least there would be no bruised elbows or knees trying to cram myself into a closet bathroom. With the unassuming exterior, it looks like it could fly under the radar, too. Not sure what the codes are in that area. Great use of an existing footprint, and delightful interior. Would be great income from an influx of medical students or US coast guard in our area. Most are single and only here 3 or 4 years. A huge step up from most rentals they have access to here. Well done. I wish we could do this in our area. Not allowed yet, but hopefully soon. The family house has been separated into 1 large and 2 smaller living spaces for family members so far, if we could convert the garage it would make a great spot for my younger son and his partner. It isn’t needed for cars, just ends up being a junk and dead project magnet. I can’t believe that you made such a beautiful conversion Your renovation is as good as any top designer could do. Awsome! Do you know of any long term tiny house rentals in Boulder, Louisville, or Lafayette for May or June? Next post: Simple Living as a Family in a Small Modern Dome Home?